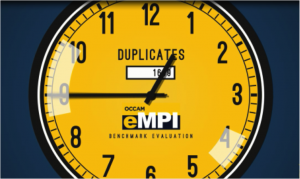 Occam enterprise Master Patient Index (eMPI) software helps bring patient data quality issues to the surface in clear view so you can get your patient data clean and keep it clean. The first step is to find out how many duplicates records and misidentified patient exist in your systems. As a no-obligation offer, we’d like to provide you with a complimentary Benchmark Evaluation. 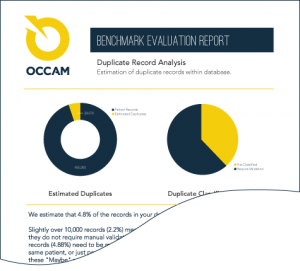 Within 72 hours, we can scan your patient data and conduct a benchmark to provide you with a report of how many duplicates records and misidentified patients you have in your systems. If your patient records are split across more than one registration system, we can also report on the number of common patients and demographic information that is out of sync. Complete the form on this page or call 630.701.9030 to request a Benchmark Evaluation. Complete the form below or call us at 630.701.9030. The Benchmark Evaluation is complimentary and there is no obligation.